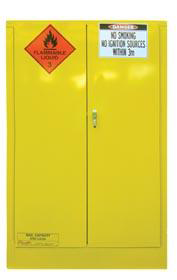 Flammable liquid storage cabinets that comply with AS1940-2004. 30L to 300L liquid storage cabinets available. Outdoor relocatable bulk dangerous goods stores provide immediate safe, compliant and efficient storage of large quantities of dangerous goods without the problems and expense associated with building fixed and permanent stores.